When the decisions of the World Motor Sport Council were announced yesterday, I had just posted my (suddenly out-of-date but still relevant) thoughts on the diffuser controversy; I was presented with the choice: do I write a rushed assessment of the changes now or do I let them fester overnight and produce a more thoughtful response today? In the end, I opted for the latter and contented myself with a few impassioned explosions in F1 Fanatic's comments system. I am glad I did. Yesterday I was consumed with rage and despair, in common with the majority of fans, and anything I wrote would have been a rant against the FIA, Mosley, Ecclestone and everything else that threatens the future of F1; this morning I have realized that it is not the end of the world. 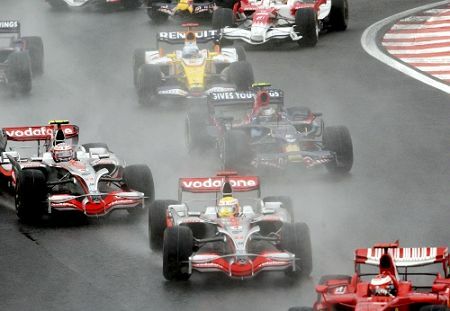 Life will go on and there will be motor racing, even if it is not honored with the name of F1. It is even possible that I might set personalities aside for a while and consider the effect of the changes from a dispassionate viewpoint. The announcement, for those who have not seen it yet, is available for study on the FIA's website. Of all the points, the one that really has the fans in uproar was the first, the decision to keep the existing points system but award the championship to the driver with the most wins. This was an obvious compromise between the FOTA's proposals and Bernie's call for a medal system and, as such, it fails to address the weakness of the existing scoring system. The comments, currently running at 397, on Keith Collantine's post on the matter contain all the pros and cons together with several hypothetical cases and I am not going to rehash them all here. I detest the idea of reducing the championship to a mere count-up of wins but have nothing to add to the debate or my previous posts; more important is it to consider the likely effect of the system, I think. And the truth is that it will probably have no influence on the championship or the racing whatsoever. It is rare that the champion is not the man who scores the most wins, even with the present system having so small a points difference between first and second places. The fact that last year's championship was one of those occasions makes us see the change as more far-reaching than it is; the likelihood is that this year's champion will score more points than anyone else as well as having the most wins. In effect, we are getting incensed over something that may not have any effect at all. And that includes the racing. Bernie is convinced that the new system will force drivers to race harder but this assumes that the drivers have not been trying to win in the past. This is such a load of nonsense that I hardly need to repeat that competition is the very raison d'etre of F1 drivers and the scarcity of overtaking in recent years has been entirely due to the design of the cars and the circuits. Does anyone recall Alonso's fury at the 2007 Indy GP when he found that his every attempt to pass Hamilton for the lead was frustrated by the rev limit imposed by the regulations? It would not have mattered what scoring system was in place - there was nothing Fernando could have done to defeat the laws of physics and allow him to pass. That is the extent of Bernie's insult to the motivation of the drivers. Of course, it is entirely possible that there will be more overtaking this season. No doubt Bernie will claim that this is due to the new scoring system but it will really be the result of the technical regulations being changed to make the cars more able to pass each other. And I see that I have not succeeded in keeping personalities out of this consideration. Ah well, that is the product of my indignation seething in the background and I will try harder to curb it as we continue. Suffice to say that, in all probability, the new system, idiotic as it is, will not change the result of this year's championship at all. There is little point in looking beyond 2009 since the system will almost certainly be changed again at the end of the year. What will bring about that change is a very minor effect the new system will have; it will produce a champion earlier in the year than previously. I say minor because we have seen championships won early before but the closeness of recent seasons will have raised fans' expectations and there will be an outcry that the last few races are no longer relevant. Even Bernie will be able to see then that his idea was counter-productive and the system will be tweaked and twisted into some configuration even more obviously defective. Such is the nature of life in modern F1. So the fans are right to be in such an uproar but it is probably all wasted energy. Far more important is the measure that affects the teams - the imposition of a voluntary budget cap for 2010 with inducements for those teams that opt for it. Fears of a two-tier formula immediately surface but, again, I think the effects of this measure will be very different from our present assessments. In fact, it may be that the FIA has unintentionally pointed the way back to a past that we had thought was gone forever. There have been two-tier formulas in F1 before; the period of changeover from normally-aspirated engines to turbos is an example. And what happens is that one route very quickly proves itself the way to go and everyone opts for it. This will happen with the new formula - indeed, it is very likely that all of the teams will take the budget cap option because it offers technical freedom and the greatly reduced cost will be attractive to their masters, the team owners. Naturally, the budget cap will prove impossible to police effectively but that will be true for all the teams and there will be all sorts of nefarious things going on under the cover of darkness. So what else is new? F1 has always had a culture of sneaky goings-on in the effort to gain a competitive advantage; stand by for endless speculation over whether this team or that team has found a way to tap into an unnoticed source of invisible income. Expect, too, constant rule changes as the FIA try to stop up the holes in the dyke. Oh, it should be great fun. The over-riding effect will be much less money spent, regardless of how creative the teams become in their accounting. And this means that we will truly be revisiting history, with innovative design and invention becoming the arbiters of performance, rather than the size of wallets. As someone has already pointed out, engineering genius is not a product of huge amounts of cash (viz. Toyota) - it is something that emerges in an atmosphere of freedom. Let us not despair over the dubious idea of a budget cap, therefore. Inefficient as it will undoubtedly turn out to be, it will still present the teams with the opportunity to reduce costs spectacularly and compete more effectively in the design field. The increased restriction on testing is something that should worry the teams a great deal. We have yet to see what effect the ban on in-season testing will have on the development of the cars this year and limiting testing even further will only exacerbate this. It may well be that the top teams' ability to accelerate away from the others through development will no longer be true and we will end the year with grids that look remarkably similar to the ones we started with. Late charges from the midfield will become rare indeed. Changes to the media regulations are more or less in line with FOTA's suggestions and can only make things more interesting for the F1 fan. They will not affect the quality of the racing, of course, but the measures are at least a step in the direction of improved television coverage. Really? And when will the teams be informed? Time is short (in fact, it has as good as run out) before the first race of the season and I hope we are not going to be presented with amendments that cannot be implemented by the teams before the start of Practice in Melbourne. To sum up, the WMSC document is a glorious hodgepodge of half-baked ideas that will have effects and consequences that we cannot imagine at this stage. The sport will be changed massively from its present incarnation but has a chance of emerging as a beast not too far removed from its roots. I suppose that I must be philosophical and accept that change was inevitable; the amazing thing is that the unintended consequence of the change may well be a return to the past. And, if that turns out to be the case, I do not care what brought it about, I am happy. How can something voluntary be imposed? How much of the industry will move to China or India? I think we will soon see if Fota is a paper tiger or not. The new scoring system has angered me as I do not think the winner should be the driver who has won the most races rather than the driver who has performed the best over a season. I however agree that most of the time the best performing driver will also have won the most races. It also makes the scoring system a whole lot more complicated for newcomers or casual observers. Theoretically a driver could win the first 5 races then spend the rest of the season making sure no other driver can take 5 or more wins (Schumacher would have had a field day...). I can't think of any other sport where there is a dual points system (apart from to sort out tied places). I wonder if the newly added ammendments will be diffuser related now that it is clear the the Brawn seems to be a geniune threat to Ferrari? Nick: Yes, an apparent contradiction in terms - you have caught me in a terminological inexactitude! Yet it is true in an odd way since I don't see the free budget/restricted development option as viable at all. FOTA's reaction is interesting - I think they're furious and with good reason, since their suggestions have been largely ignored. This could easily lead to effects that I have not dealt with in this post, preferring to save them for a later one. As to being a paper tiger, however, I think that as long as Luca continues as spokesperson for the alliance, FOTA will be a powerful influence on the sport. Lee: I sympathise with your anger entirely - I am still seething at the potential injustices of merely counting wins to decide the championship. Hopefully, it will have no effect, however. "[The FIA will] adjust elements of these freedoms to ensure that the cost-capped cars have neither an advantage nor a disadvantage when compared to cars running to the existing rules." Surely they can't mess with the diffuser this late in the game. Even Mosely said he thought it was perfectly legal... although with the opportunity of teams to protest the legality of them at the races we may get a revised opinion from the FIA scrutineers. Excellent point, Mr Soap. I share your suspicions regarding the FIA's impartiality in the application of that particular phrase, apart from the fact that it is unworkable and contrary to the spirit of competition so necessary to F1. Our hope has to be that all the teams take the budget cap option and so this aspect will never come into play. Here is an article with a historical look back and how the new points system would have changed the past championships....it is interesting. Dave: THE FIA can, and increasingly it looks likely that they will, mess with the diffuser rule after the commencement of the season, most probably with a "clarification" once the race has finished and all protests are in. They will defend this by saying they cannot rule in such matters until protests have been received - which makes a nonsense of trying to get parts accepted before the beginning of the season. It will probably take the form of the movable floor decision a couple of years ago: ban the thing after the race but allow the result to stand. That is very unfair to the teams who have been clever enough to design the alternative diffuser, even more so than was the case with the movable floor, which was an attempt to circumvent a rule by deceiving the FIA's scrutineering procedure. The fancy diffusers merely point out a loophole in the rules and make no attempt to conceal what the team is doing. Aracer: Interesting indeed and yet more fuel for my argument against the championship going to the driver with the most wins. Didier Pironi indeed! I think that first of all, we're still in shock. After we have watched the FOTA proposals, and we agree them, because they were balanced and pragmatic. And see what Mosley decided yesterday, I had no doubts: these decisions were political. About the rest of the decisions... the 33 million budget cap is good for the newcomers, but he knows that sooner or later, Ferrari and McLaren will try to go there, if their competiveness is been threated. And, in a radical manner, could be antoher reason to go away. Who wants to be in a competition where development is severely blocked? What I know now is that Mosley declared war on FOTA, to test it's credibility (the paper tiger, like someone said earlier) He's going for elections this year, should FOTA choose someone to contest Mosley on this election, before trying anything more radical? I don't know where to start... WMSC, the FIA, Formula 1... Which formula!? It has changed so many times between the end of 2008 and the beginning of 2009 that one cannot rely on the 'formula.' I would think that any team that was on the fence regarding staying or leaving would now want to leave. Who could justify staying in the sport when each 'secret development' that exploits a loop hole or maximizes an advantage is undermined by a judgment after the fact (thus making it a waste of money). It is time for FOTA to act as arbitrarily as the FIA has acted, but the nature of their rebellion should be a stubborn adherence to their formula. If that means splitting away, I support them. The manifest quality of the FIA and WMSC negotiations/regulations/rulings is a lack of clarity, consistency, or good faith. FOTA should cease negotiating with a governing body that cannot follow through. They need to save their sport; any claims by Mosley or the WMSC that the teams are being recalcitrant is rubbish. Further, I cannot imagine anybody wanting to field a new team in this environment. I am interested to hear the USGPE (worst-name-ever) reaction to this development. Speeder: Unfortunately, the design of FIA elections to the office of president ensures that FOTA cannot put forward a candidate unless they persuade some delegates to do so for them. And that is unlikely in view of how Mosely has arranged things so that he always has a majority of delegates who will support him. The only way for the teams to escape the madness is to form a breakaway series and, as Alianora has pointed out, that would be extremely difficult to arrange. It may come to that even so but more likely is that the manufacturers will just withdraw, leaving F1 to stew in its own juice. Marc: Agreed. FOTA's response to the decisions is a veiled warning that the teams are not happy with the way things were done by the FIA and the danger is that manufacturers will withdraw in disgust at Mosley's inability to work honestly with them. Far from encouraging an increase in the number of teams participating in F1, the decisions run the risk of forcing the departure of existing teams. Whether small teams would be tempted to take their place remains to be seen (if they do, the sport would certainly be returning to its roots). USGPE's reaction will indeed be very interesting. I'm all for the Champion being the one with the best overall season. I do agree a win should have more the 2 point spread on 2nd place however, to put more importance on winning. I would propose a 3 point spread and/or a separate award/trophy for the driver with the most wins in a season. The object of any given race is to win...after all. Quite right, Aracer, and your point would have been answered had the FIA adopted FOTA's proposal for an adjustment to the scoring system. However, we should not confuse the requirements of winning a race with those of winning a championship. Every driver wants to win every race and does his best to do so. The guy who wins gets his reward in the trophy, the girls and the champagne afterwards. But the champion will have done much more than gone for the win every time - he will have been wise enough to know when to push and when to accept that discretion is the better part of valor, when to take risks and when to let the others find the armco, what is possible and what is not. Giving the championship to the driver with the most wins cheapens the award and ignores the achievement of those drivers who finish higher than they should in less than competitive cars. Give me a hundred Keke Rosbergs before you give me a Didier Pironi. A separate award for most wins is a good idea if it would satisfy Bernie - which I doubt. I can never forgive him for having started the silly medals business, even though I don't think the FIA's compromise will make any difference in the end. Suffice to say I’ve little to add to the anger-disgust-contempt already voiced in regard to this latest installment in the ongoing stupidity saga, but my greater concern is that I see little possibility of change looming over the horizon - unless some radical action is taken. Sadly, of the best people available, I fear that few will be interested in filling the (hopefully imminent) FIA presidential vacancy. By definition, the best possess a degree of intelligence, experience and competence that makes them prime candidates, and such an individual would know very well that to be effective (and incidentally, preserve their reputation too), the FIA’s current bureaucratic mess would have to be quickly trimmed into some semblance of competence and efficiency. To accomplish that end in a timely fashion would require a hatchet-man approach, with the necessary powers granted to act accordingly - and therein lies the real problem, since such an authority could be difficult to attain. Certainly the incumbent crop of buffoons would come out against it en masse, merely to preserve their long since redundant positions, and after witnessing the performance (or more correctly perhaps, the lack thereof?) of Mosley and his predecessor Balestre too, both of whom enjoyed such a dictatorial tenure, the few responsible parties involved would (or should) quite correctly move to ensure that particular mistake did not happen yet again. So, there is no choice but to accept the best applicant and watch this unfortunate become enmeshed and ultimately overwhelmed by (or absorbed into) the political faction? Not at all, but unless the whole organization changes (for the good), no matter who the new president is, F1 will suffer on with little improvement. Since the FIA is not likely to voluntarily change, and a new president would likely not live long enough to make the necessary changes any other way, the best remaining option is still for the current F1 series to shut itself down and re-emerge under a ‘clean sheet’ scenario - less the parasitic CVC, the FIA’s bumbling mismanagement and the dynamic duo of Bernie & Max too. Indeed, much the same as any reasonable thinking person does when their car eventually becomes an unacceptable liability. Alianora has previously explained the theoretical complexity of a mass Teams’ - FIA divorce procedure, but in reality court cases are routinely won on which party can outlast the other financially (a losing FIA condition, since manufacturers earn an income, but if they go, so does the FIA’s assessed income), or on just plain logic, which any jury would find sadly lacking here (that is, in a real court, rather than the kangaroo variety favored by the FIA & Co., Ltd.), or perhaps on precedence, since no such expensive and risk-laden actions have been taken against past deserters of the now defunct (well, depending on the interpretation) 1998-2007 Concorde Agreement, never mind against the powerhouse of some ten teams forming a unified defense - although admittedly, such a thing in itself would be rather unique. Indeed, us old boys do tend to rattle on ... and on. David: It's a dismal picture but all too accurate, I think. The teams probably don't have the unity required to form a breakaway series, however, and it is more likely that the manufacturers will pull out one by one. I am inclined to watch how FOTA respond to the latest FIA initiatives and hope that they find a way to influence events rather more effectively than at present. The teams' one lever is that they don't have to be in F1 if they don't want to be, whereas the FIA and CVC have to keep them in somehow. Perhaps a clear ultimatum from the manufacturers would be more effective than their present attempt to politely suggest the way forward. This is the dumbest possible way to decide the champion. I can't believe Bernie came up with a system like this. The one thing we can be certain of is this system will not last long. The first time a team has an advantage like Ferrari had in 2002 and one driver wins the championship by round 10 it will be dropped like a hot stone. The budget cap is clearly designed as part of Bernie's divide and conquer tactics. The top teams will object strongly to this as McLaren, Ferrari etc will never accept slashing their business to that extent. To me Bernie is working at maintaining his control of the sport. Thee are two ways he can do that. Split FOTA and maintain the status quo of the past couple of decades or trigger a FOTA breakaway and trasnfer his media and track contracts to that championship and leave Max and the FIA high and dry. I hope FOTA use these changes to throw their weight about. If they are as solid as they seem to be FOTA should refuse to race in Australia until the champion is chosen by the previous method or by their points system. As he has done in the past Max would no doubt decide after Aus that any changes made as a result are now null and void and everyone involved has to write 100 lines but if FOTA stick together there is absolutely nothing he can do about it other than decide GP2 is now F1. Of course that would make him look very stupid because he was the person who said that the real F1 championship is the one Ferrari are in. FOTA's statement after the WMSC's announcement is being taken as the teams' response - it is not. Luca makes it pretty clear that FOTA will discuss their reaction and will decide what to do about the FIA's unilateral decisions. I doubt that will be as immediate as a refusal to race in Australia but I can see it being strong enough to shake the FIA into sanity. We have an interesting battle forthcoming, I think. I suppose the counting of points has been retained as a way to sum up how much cash the FIA collects from the drivers for doing well. In the same vein, if the FIA does not tell the teams if the cars are legal or not before they race, they can fine them afterward for running illegally. With crap like this going on it is difficult to comment without sounding like a conspiracy theorist! Hah, the FIA has always made the conspiracy theorist's job easy! They really do not give a hoot what anyone else thinks. Correct me if I'm wrong, but isn't Bernie's job just to arrange the races? So why the heck is he sticking his beak in to the scoring system used? Bernie still thinks of himself as Mr Formula One and achieves his ends through manipulation of others. What does he care about what he's supposed to do? Actually, I don't think this has anything to do with Ferrari winning or losing - Luca's anger shows that. The popular theory is that the cap limit is a bargaining counter intended to introduce a much higher cap that the manufacturer teams will accept after argument. That is possible but it's a risky strategy as the teams' patience with Max's strategy is wearing thin; they may just call his bluff. With a GP2 team costing about £4m per year, the budget cap at £30m (with all up-front expenditure to be done before officially joining the series) and the potential (and in at least one case, likelihood) for the £200m teams to still exist, I don't see where the new teams would be coming from. The fundamental problem is still there. For that matter, the differential between the two tiers is such that the capped teams may well need to cheat (in terms of undeclared income/goods) to survive in F1. I have a horrible feeling that the WMSC has just imposed nine-figure annual entry fees as a minimum requirement. Oh, and note that FIA fines are excluded but not other FIA expenses. They're billing €300,000 entry at the moment - insignificant to the teams at the moment, but necessary for the FIA's cashflow and not really affordable by budget-capped teams playing by the rules. I don't think the budget cap teams would be at a disadvantage at all. Just the removal of the rev limit on their engines would be a huge advantage, as can be seen by the relative performance of the RBR and STR cars in the latter part of last season. To me, it looks like the budget cap option is the only way for the existing teams to remain competitive. The thing that really grates is that there is one group of people who are far more important than the teams, the sponsors, the drivers and the FIA and that is the fans. Without the fans there would be no sponsors, with no sponsors there would be no teams and with no teams there would be no F1. Yet the FIA refuse to take into account the feeling of the fans (it has taken FOTA and other groups to pressure them into releasing more race data). Bernie also has no interest in listening to the most important people in the sport. We don't even have High Def coverage coming to the BBC as bernie will not invest in the equipment (yet this was one of the things I was looking forward to with the move to the BBC in the UK). I was getting very excited at the prospect of the overtaking etc but now the words of the FIA have took the shine off everything. I am now worrying that we will see a repeat of last seasons farcical decisions and politics at the expense of racing. £30m was about what Minardi spent on the 2003 campaign. That was the year they lost 1.5 seconds to the front-runners - and the top-spending teams are still spending the same amount (the increases between 2003 and 2007 having cancelled out the 2008-2009 cutbacks). If an established team can't keep up with the free-spending teams on that budget then, they're not going to manage it now - and a new team certainly won't. The free-spending teams will still get faster; they'll just spend everything they have to make those improvements. The only way this could work is if the free-spending teams were limited in their external funding. The FIA has no direct influence on the manufacturers' spending, though I suppose they might cut funding to F1 if the FIA continues to make proposals which go against their interests like this one. 1) The perennial aim of increasing his own power over his domain. 2) Cashflow in the FIA. If the organisation can't pay his bills, then Max loses all his power in one go - either by being voted out of office or by the bailiffs removing him. 3) The future. Max may or may not have a successor in mind (personally, I think he's still weighing his options), but in any case he'd want to be remembered as greater than whichever successor he picks (without it being such a disaster that he is remembered for picking a bad successor). This set of regulations may well serve all three. It increases Max's power by showing everyone that FOTA can be crushed like a bug any time the FIA wants. Whether this set of regulations does it or not is of secondary importance (though for Max and the FIA it would be a bonus if it was). Max likes to be seen as the big cheese because his favoured style of power is the command-and-control kind. It also shows that Max can get his way whenever he likes through his mastery of the political arts, which sends a message to the WMSC that they would be foolish to go against him - useful to him at any time, but especially in a year where he may stand for election. The cashflow problem is eased by two things. Firstly, FIA fines are outside the budget caps (giving the FIA freedom to impose whatever it likes). So it, unlike most other parties in F1, can charge what it wants for fines and nobody can complain. As an aside, it also means that it can extinguish a budget-capped team fairly easily if it suspects a major infraction of the rules - or decides it wants it to look like a major infraction of the rules has been committed. If a £30m-budget-capped team suddenly gets a £50m fine, then suddenly it needs to find £50m of sponsorship. It will be clear to sponsors that such a team is asking for the money purely because of a breach of the regulations, which would do considerable damage to any company's advertising campaign. So a team with that sort of fine which has a budget cap will be forced to close down because it will have no way of balancing the books. It can also charge draconian fines for "accountancy failures". Accountancy, despite its mathematical basis, is not an exact science. When an organisation which knows as little about what it wants as the FIA gets involved, the waters muddy further. Since few people understand the finer details of accountancy, most people will not question a fine on this basis, even if the team in question has been entirely blameless in their accountancy practises and it is an FIA error that has led to the fine. And with the budget cap so low, budget-capped teams needing to survive will have to cheat in the accountancy department in order to compete - which means they will be permanently at risk of such fines if caught. For the non-budget-capped teams, there is plenty of scope in a differential formula to give them additional substantial costs, especially given that Max has already said that he wants the two sets of teams to be in equivalency. Max probably wants the teams to go to the budget-cap system eventually to give the FIA more power over them, even if he's not around long enough to see it, so that will give him even more incentive to charge massive differential fees. Charging for indifferent pitlane common equivalent would be just the start - there'd be charges for everything from regulation testing equipment to "fighting funds" for budget-capped teams in case the performance difference became blatant enough to damage Max's power base. As for the future, if Max leaves F1 in enough of a mess, his successor will be too busy cleaning up to make their own distinct mark upon the sport (or any other area of the FIA's operations). Finding someone skilful enough to look like they could be president competently without being too competent is harder. I believe he's still not sure whether Todt or Donnelly would be better for the purpose and it's possible he could be quietly considering other candidates too. The advantage of the two mentioned is that they are sufficiently pro-Mosley not to mind if Max stays on, and furthermore they will declare further contributions Max makes to the mess as good for Formula 1. It's not so much a scam as messy politicking that puts Max in Bernie territory. Lee: And it looks like the first farcical decisions will be made in at the first GP of the season. Bernie has guaranteed that the fancy diffusers will be protested in Melbourne. Note that the main area in which the FIA gave FOTA what it wants is in the matter of media access to the teams and drivers. This was a proposal driven entirely by the "survey" conducted by FOTA and so the FIA can appear to be giving the fans what they want. But it is also the area that matters least to the sport itself - the fans' views in the important areas of scoring system and racing regulations have been completely ignored. We were never asked whether we thought a budget cap would be a good idea, for instance (not that any of us were actually asked - I have yet to see a single claim by a fan that he completed FOTA's questionnaire). The real fans are marginalised. When the FIA or FOTA want it to seem that the fans matter, they issue questionnaires with all the wrong questions and use a sample heavily over-populated with casual viewers and non-fans. The true F1 devotees, who might have useful opinions on important matters, are swept aside. The same goes for the drivers, the ones who are going to have to work within whatever crazy rules are devised - they are completely ignored even by FOTA. Alianora: I still think that the budget option is the better of the two alternatives and, as such, will be adopted by all of the teams. Minardi could not compete with the rich teams because it was bound by the same rules. In its time, the team came up with several simple but effective chassis but were always handicapped by having to use over-the-counter engines that were at least 60 bhp less powerful than those used by the big teams. Had they been permitted the aerodynamic and engine advantages included in the budget cap option, I have no doubt that they would have blown away the competition. Remember, too, that there are existing financial constraints that would still apply to any team going for the free spending option. The pressure is on from the sponsors and manufacturers to bring down the amount of money spent by their teams and that will continue as long as the economic downturn continues - economists are now saying that it will last at least two years. So the non-cap teams will have less of an advantage in finances than we might suppose, even if we ignore the fact that they will be so limited by regulation that there is very little they would be able to spend their money on anyway. Money can buy tenths of a second in lap times; engine power and free aerodynamics give whole seconds. Which do you think will triumph, even supposing that Max keeps his promise to attempt parity? This all ignores the possibility that the amount of the budget cap may be a bargaining counter only. It is quite likely that Max is doing his usual trick of proposing the impossible so that he can get the teams to agree on what he really wants. In this case that would be a universal cap of say £60 million - something that the manufacturer teams are going to find more workable. As regards your last comment, I agree that the whole thing has much to do with Max re-asserting his power over the sport. It remains to be seen whether he will win this one, however, as FOTA has not yet decided exactly what its response will be. I doubt that Max is concerned about his successor. It is becoming increasingly clear that he never had any intention to stand down this year and, as we both know, he will be duly re-elected by the delegates when the time comes. Another obvious problem with the new points system is that any dubious FIA enquiry decisions will now have an even larger impact. If a driver is demoted from 1st to 4th then they are loosing out far more (even to the point where the championship is lost). I can't see McLaren and Ferrari ever agreeing to run their teams on £30 million a year. I don't think they will have to, Steven. FOTA will fight out a compromise with the FIA and the final budget figure will be considerably higher. We are 10 days or so from the beginning of the season and the rules change! Doesn't it occur to the A-Hs (not Austin Healey) That the design of the car takes into account the rules of the game? Once again an advantage has been given to the wealthy teams. Any change involving rules, dictates a different optimum design therefore at the 11th hour it's back to the drawing board which means lots more cash spent!!. All true, Nick. In fact, constant rule changes have become ever more the norm in F1 as Mosley feels the need to demonstrate his power. What does he care that he causes the engineers severe problems when he does so? Clive, the diffuser protest will be the shortest official one ever - Charlie Whiting approved the controversial models two days ago, stating that they used a loophole in the regulations! As for the budget cap, Minardi didn't have enough in the kitty to develop aero from an established base and there is no indication that the existing teams' engines will need to be any cheaper than the £8-£10 million currently spent. And that's just for the engines. There may be a standard engine mooted, but it was only going to be available and much cheaper if four teams took it (with the option being present but costly if three teams accepted). Since Brawn went for Mercedes and it's unlikely to be a one-year deal, there are only two possible teams who could take the Cosworth - USGPE and Williams. If you spend a third of your prescribed budget on standard engines and then need to pay 100 or so people for the season, you're looking at enough to run the team but not to develop anything and therefore finding the freedoms to be of virtually no value. Unless the team cheats, which I suspect they all will, through obligation if nothing else. If there are teams with ten times the budget (and Ferrari almost certainly will if nobody else does), survival will always be difficult whatever the formula. It didn't help in the 1980s and it won't help now because the laws of economics remain the same. If the recession will last at least two years - well, it's already lasted nine months, so the turning point should still be mid-2010. As soon as that midpoint is reached, a team that can make a valuable enough offer to a company will be able to get it, and the richest teams with results will get them first however small the cheques may initially be. The budget cap has been mooted since 2004. If it's a bargaining chip, it's a seriously overused one. That said, it could still be the ploy that you suggest. What Charlie did two days ago was give his opinion that the diffusers are legal because they use a loophole in the rules. It was not an official ruling which is what is needed to avoid protests in Melbourne. Last year we saw just how much Charlie's opinion is worth - Hamilton's pass at Spa was fine by Charlie when McLaren asked, but that opinion was brushed aside after the race. I am quite sure that the 30 million euro budget cap will not remain at that rate for long. Most commentators are guessing that Mosley is really angling for about 60 million, in which case aerodynamic work becomes easily possible. It is not rocket science anyway when you are allowed movable wings, which immediately give the team access to huge downforce in the corners with virtually no drag on the straights, no matter how crudely implemented. The advantages thrown in with the cap make it the obvious choice, whether or not Ferrari and McLaren go that way. Money won't help the big teams because they will be limited to tiny design improvements within a restricted formula and engines that are frozen for a few years yet. As I said before, the economists reckon on at least two more years of recession from now, not from when the recession started. It's a guess anyway and companies are not going to be falling over themselves to invest in F1 as soon as things pick up - they will wait until their financial strength is recovered before throwing their money around again.